October is Agriculture month in Saskatchewan so it's a great time to appreciate the farmers hard at work harvesting their crops, and to celebrate our local agriculture. 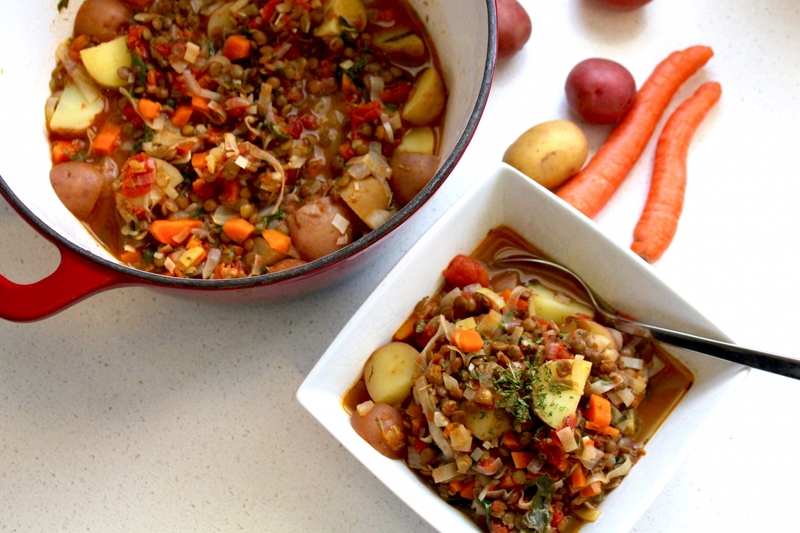 This stew couldn't be closer to "local food" - this time of year it is easy to find all the main ingredients grown in Saskatchewan. Two key ingredients that I want to highlight are big crops in Saskatchewan and contribute a great deal to our overall economy - Canola oil and lentils. Lentils are a pulse crop and make an excellent plant-based protein option offering 6 grams protein per 1/2 cup serving. They're also a good source of folate and potassium, two nutrients that Canadians arguably are not consuming enough of. Although we export much of the lentils grown in SK to other parts of Canada and the world, this local crop is readily available and very inexpensive. Consuming more plant based proteins supports good health and a more sustainable environment. Now, the recipe! I used all the same herbs and spices you might find in a typcial beef stew, so this recipe does NOT lack flavour. If you're new to lentils, feel free to combine lentils AND meat as a starting point. 1) Over medium heat, warm the canola oil and add the onion, garlic, leek and carrots to sautee a few minutes. 2) Add the potatoes and sautee another few minutes before adding the canned lentils, tomatoes, and spinach. 3) Add the water and vegetable stock. Bring to boil, stirring regularly, then reduce to a simmer. 4) Add the herbs and salt, stirring well. Then cover and let simmer until the potatoes are cooked through.